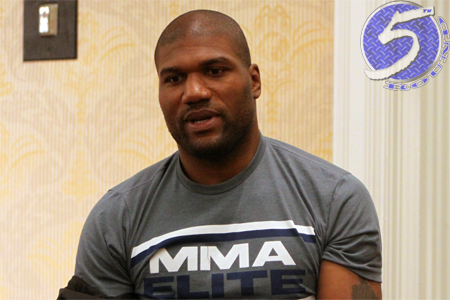 If UFC president Dana White knows what’s best for him, he should never utter the name “Quinton ‘Rampage’ Jackson” ever again – this according to Quinton “Rampage” Jackson (pictured). Since leaving the promotion to join forces with Bellator MMA, the UFC’s biggest rival, Rampage and fellow bitter former UFC light heavyweight champion Tito Ortiz have embarked on a national tour talking smack about their time with the planet’s premier mixed martial arts promotion. On this week’s edition of “UFC Tonight,” White was asked about Rampage’s recent remarks, and as expected, he was more than happy to return fire. As we all know full well, word travels fast in this day and age. It moves even quicker courtesy of Twitter. Obviously, Rampage was none too pleased to learn what his former boss had to say about him. “@danawhite if I was u I would keep my name out of your mouth. If people ask u a question about me n a interview it’s best 2 say no comment,” tweeted immediately after White’s interview. Rampage and Ortiz headline Bellator’s first pay-per-view broadcast on November 2. Just as certain as the day is long, there will be more UFC and White bashing coming from the two leading up to their scrap.